Heavy spiced dzo meat charred to perfection over an open flame. Common fate amongst the nomadic steppe tribes. A simple dish consisting of Cieldalaes spinach sauteed in rich salted butter. Ground meat rolled in cabbage and boiled in broth. A salad of various seasonal tubers tossed lightly in a rice vinegar dressing. Ground dzo chuck and various steppe vegetables wrapped in buttery dough and deep-fried in oil. Sliced magma beets and lean loaghtan meat slow cooked with vegetables and served with a dollop of rich sour cream. 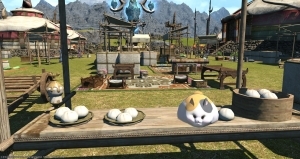 A dish popular throughout Ishgard, though families in the Brume often use the meat of animals easier to find in the district's dark back alleys. A simple stew commonly made of diced dzo chuck and whatever vegetables are readily available. A popular dish amongst the nomadic tribes of the Azim Steppe.